In this tutorial we will learn how to install and use three great command line programs for network monitoring or in other words how to find out which programs are using bandwidth. nethogs is an open source command line program that is used for monitor real time network traffic bandwidth used by each process or application. That's it, nethogs is installed and ready to be used. As you see above the send and received lines show the amount of traffic being used by per process. The total sent and received usage of bandwidth calculated at the bottom. m: Change displays between "kb/s", "kb", "b", and "mb". r: Sort by traffic received. s: Sort by traffic sent. Although this is a simple tool, nethogs is a great way to associate traffic with a specific applications. 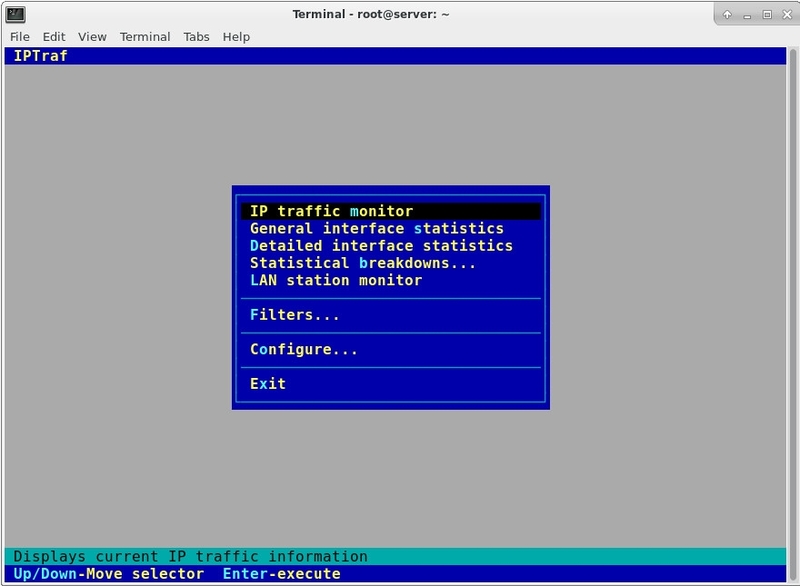 IPTraf is another great way to monitor network traffic. It provides a number of different interactive monitoring interfaces. With this menu, you can select which interface you would like to access. For example, to get an overview of all network traffic, we can select the first menu and then "All interfaces". Here, you can see what IP addresses you are communicating on all of your network interfaces. If you would like to have those IP addresses resolved into domains, you can enable reverse DNS lookup by exiting the traffic screen, selecting "Configure" and then selecting "Reverse DNS lookups". You can also enable "TCP/UDP service names" to display using the names of the services instead of the port. There are several other interfaces to investigate on your own. netstat (network statistics) is a command-line network utility tool that displays network connections for the Transmission Control Protocol (both incoming and outgoing), routing tables, and a number of network interface and network protocol statistics.It is extremely flexible and powerful.